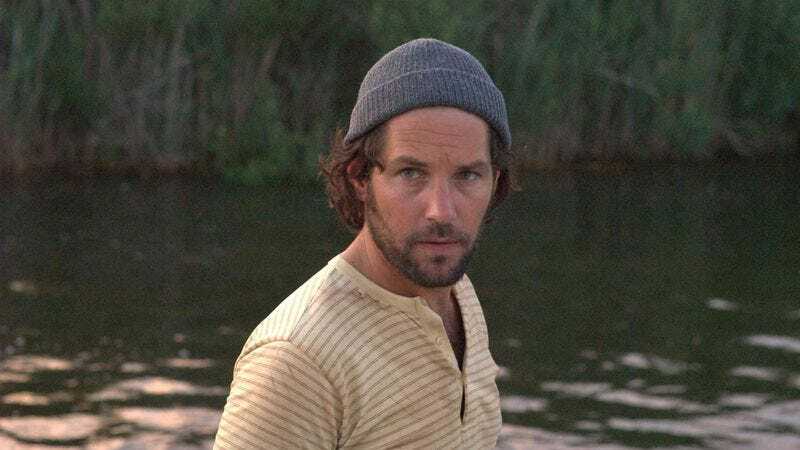 Paul Rudd hasn’t built his career exclusively on comic acting; he’s done Shakespeare (Romeo + Juliet), Neil LaBute nastiness (The Shape Of Things), and Miramax Oscar bait (The Cider House Rules), among other non-comedy projects. But the star has found his greatest success working in ensembles managed by the likes of Adam McKay, Judd Apatow, and various guys from The State. It’s these associations that make Diggers seem like such an outlier on his resume. Rudd stars opposite State alum Ken Marino, who also wrote the screenplay, in a film executive-produced by David Wain—yet precious few high jinks ensue. Instead, Marino and director Katherine Dieckmann offer drab surroundings (the digital cinematography has little of the pop Dieckmann brought to episodes of The Adventures Of Pete & Pete and several R.E.M. videos) and well-observed material for Rudd, Marino, and underused actors like Josh Hamilton and Maura Tierney. The film follows Hunt (Rudd), Lozo (Marino), Cons (Hamilton), and Jack (Ron Eldard), a quartet of Long Island clam diggers carrying on a rich family tradition of back-breaking workaday misery. The death of Hunt’s father and the arrival of a company regulating where in the bay they can earn their living compound the hopelessness. Diggers isn’t entirely unfunny, though; it just operates in a less ironic or outwardly charming key than the likes of Wet Hot American Summer or Role Models. Hamilton plays it lighter as a relatively carefree stoner, and Marino gets some laughs as an overmatched father of five (and counting). But if Lozo’s outline is broad, there’s also real anger and frustration simmering beneath the surface of a guy who specializes in pre-emptively eliminating options and then raging pointlessly to his wife (Sarah Paulson) and family. Rudd, meanwhile, has the straightest role: Hunt attempts to fill the void left by his father as he stands by his sister Gina (Maura Tierney) and does his best to ignore how unhappy his life is making him. Diggers has several Rudd-centric scenes that would be at home in one of his studio comedies: a solo rehearsal of what he anticipates will be a testy conversation and his low-key wooing of Zoey (Lauren Ambrose), a New Yorker hiding out from the city. That these moments fit comfortably into a downbeat slice-of-life dramedy is a tribute to Rudd’s underrated range. Even within his comedy career, he finds nuances that differentiate his Ruddian characters—and Diggers serves as a reminder of how effective he can be in less hilarious surroundings. Availability: Diggers is available on DVD, which can be obtained from Netflix or your local video store, or to rent or purchase from the major digital outlets.